This week it’s another one of our famous open discussion shows with different business sectors. We discuss Marketing, the cake business, design and SBS. Knowing Your Business interview Lauren Morton, Rania Freij, Stuart Wraith and Gill Pavey to find out more. Show time every Thursday on Radio Horton from 10am until 12 noon. Lauren Morton explains what the ‘Marketing Chap’ is all about. We find out how the experiment to discover if it was possible to become influential merely through content sharing, social media, and blogging actually worked. Rania Freij tell us what it’s like to start a cake making business. Magic Mixer Cakes & Bakes are dedicated home bakers committed to making high quality bespoke, handmade cakes & bakes. Stuart Wraith explains branding, design and illustration. Gloucester based designer dealing with everything from business cards to exhibition displays and everything in-between. Theo Paphitis SBS Winner for October 2013, Gill Pavey. Wordhouse writing services is headed up by Gill Pavey who offers services in proofreading, copy-editing and copywriting. Gill started proofreading in the 1980s when she was employed by a water sports magazine group in London before moving to a provincial newspaper. Over the years she has become an accomplished copy-editor and is now part of an international team based in mainland Europe, copy-editing academic papers from around the globe. Gill has extensive experience with academic work by non-native English speakers and has transformed documents translated from languages as diverse as Russian, Chinese and Arabic. 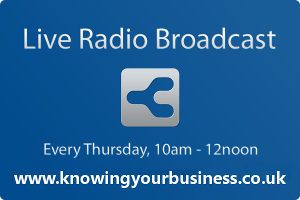 Knowing Your Business Show time is every Thursday at 10 am until 12 pm on Radio Horton.